Join us for 6 long days of mid-summer photography madness during June 2018, based in Dunquin, Co Kerry, Ireland, at the heart of some of the most spectacular scenery in Ireland. 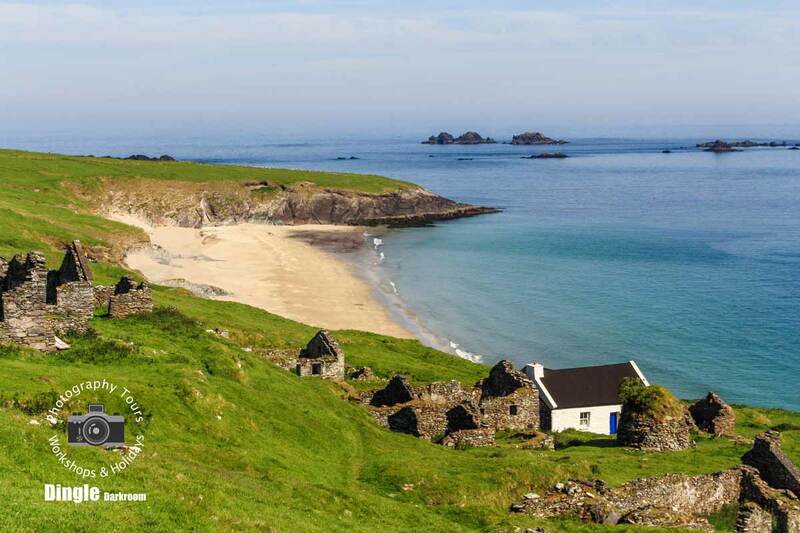 Explore the Great Blasket Island and the beaches, cliffs, hillsides and remote valleys of Kerry with your camera, led by George Jackson, a photographer with an intimate knowledge of the area. Experience group and 1 on 1 photography sessions and learn to use your camera, phone or device to its full capability. Improve your composition, use natural light to its full advantage, all the while practising and improving your photography at the wide variety of locations and interesting subjects that we visit around Kerry. 5 nights Includes single room, breakfast, dinner and all photography activities. 4.00 p.m. A walk or drive to the beach at Dunquin provides the first opportunity to relax and take in the dramatic and rocky coastline during an informal photo shoot in which we’ll begin to discuss the basic elements of exposure and composition. 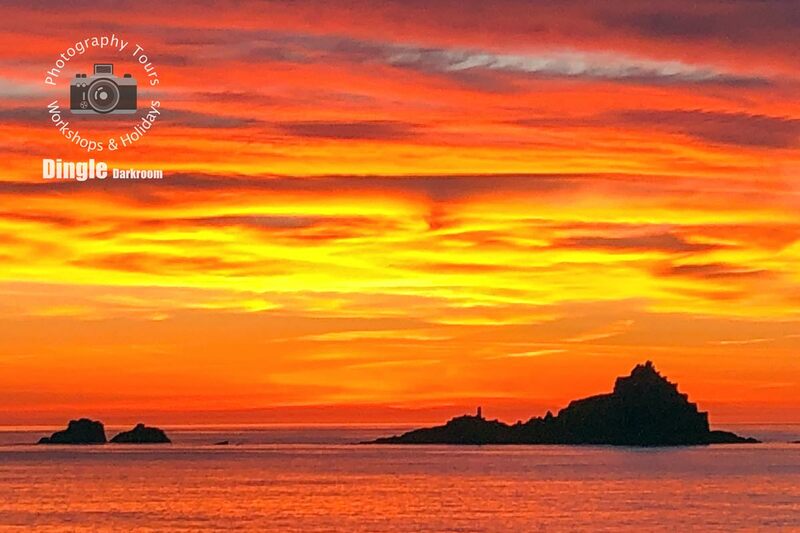 7.30 p.m. Evening tour visiting some iconic locations along The Slea Head Drive, including Coumeenoole Strand, Dunmore Head and Dunquin Pier, finishing with a chance of a touch of colour in the sky above The Blasket Islands. If conditions are promising we’ve the option of arranging a local sunrise shoot, taking full advantage of the early morning light. 8.30 – 10.00 a.m. Back to An Portan for breakfast. Daytime: We’ll learn more about your camera, using settings and techniques that suit your own ability and knowledge. Whether you take JPEG or RAW or just use your phone, we’ll begin to cover all the things both as a group and individually that you want to know to obtain better results. We’ll explore locations on the Dingle Peninsula with the option of taking a few short walks to explore further. We’ll also get an opportunity to check out and plan the location of our evening sunset and dusk shoot. 6.00 -7.30 p.m. Dinner at An Portan. 7.30 p.m. We’ll begin to familiarise ourselves with graduate filters, creative phone apps, tripods and low light photography at a number of varied locations until we arrive at our pre-planned spot with plenty of time for sunset and dusk around 10.00 p.m.
They’ll always be a touch of flexibility within the programme as we require a fine day for the ferry crossing over to the island. The days are very long during mid-summer and we’ll usually break the day into a few sessions with periods of rest and relaxing in between. Sunrise is early at around 5am and if conditions look favourable we’ll be up enjoying the early morning stillness and light for a couple of hours before breakfast. If we’re staying out for sunset and beyond into twilight, we may be arriving back at An Portan Guest House as late as 11.30pm, with this in mind we’ll avoid burning the candle, too much, at both ends! Following breakfast we’ll be departing An Portan at 10.00 a.m for Dunquin Pier. where we’ll take the ferry across the Blasket Sound to The Great Blasket Island. 11.00 a.m. – 4.00 p.m. As well as the opportunity to visit the ruins of the old village, we’ll take a walk to White Strand and also explore the near end of the Island. 7.30 p.m. Long exposure photography workshop until sunset & dusk, experimenting with different filters at a few locations around the Slea Head Drive. Following an early breakfast we’ll head towards Killarney to tour around the lakes and The McGillycuddy Reeks, stopping off on the way for a morning visit to Inch Strand. 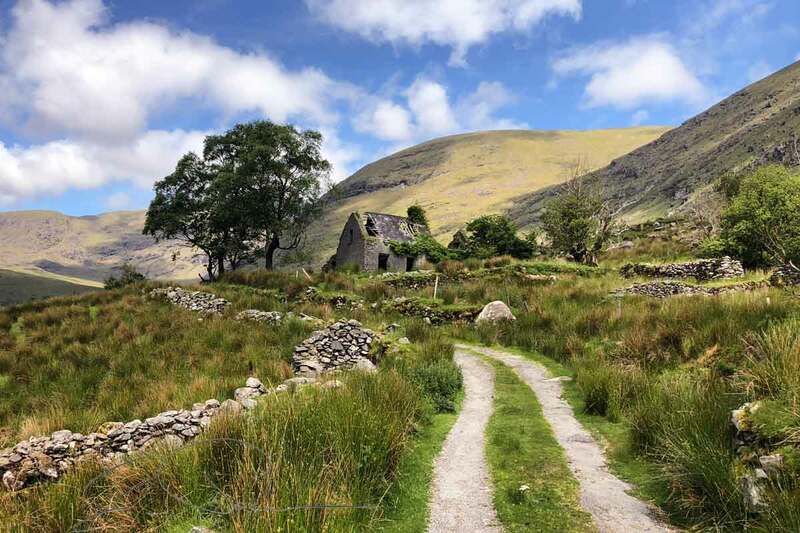 Among many superb locations we’ll explore during the day is The Black Valley, Gap of Dunloe and The Bridia Valley. 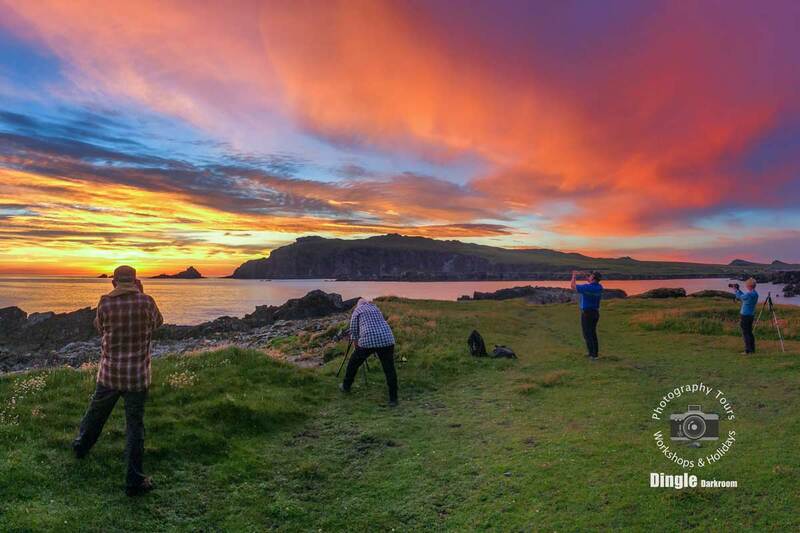 We’ll arrive back in Dunquin for a late evening dinner, with time to spare to finish the day with the possibility of a fabulous sunset and dusk over the Blasket Islands. While the coastal walks require a moderate level of fitness and the ability to climb stiles and traverse gentle slopes, for the most part, all the locations we visit on the walks can be easily accessed by a drive and/or a short walk. During the sunrise, sunset and photography tours on the Dingle Peninsula, all the locations we visit are easily accessible with a short walk using paths, tracks or reasonably level ground from where we park. However, on returning from the Great Blasket Island, the path up from the pier at Dunquin is rather steep, but we can take our time! In the event of unfavourable weather conditions, activities may relocate indoors taking full advantage of An Portan’s spacious conference and sitting room. Out early for a local dawn and sunrise shoot, taking advantage of the wonderful early morning light. 8.00 – 10.30 a.m. An Portan for breakfast. Out early for the local sunrise and taking advantage of the early morning light. !0.30 a.m. – 1.30 p.m. We’ll continue processing and hopefully end up with some fabulous images from the holiday. Includes single room, breakfast and dinner for 5 nights, photography activities and walks.